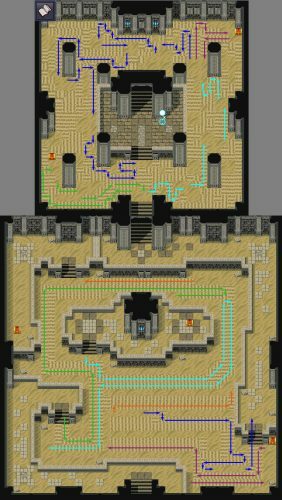 Note: If you have been playing in the touch mode to move around, then I recommend you switch to Cursor keys for this dungeon, because the character will always try to move back to the location you first tapped on. This results in uncontrolled moving when you try to use the sand slides which force you in one direction. I will also reference to arrows in the walkthrough which you can check on the map. This way I can keep the walkthrough short and simple without long way descriptions. Step on the eastern sand slide then walk west and follow the path to the next screen. Follow the green arrow east. Then head north, over the sand slide with the arrow, and collect the treasure. Step on the marked sand slide and follow the green arrows counter clockwise within the inner walls. On the southwest corner, there is a hidden path to the east into the wall that leads to a treasure. Continue walking counter clockwise till you reach the point where you entered the inner walls. At this point, follow the green arrow in the middle to reach the stairs that lead to the next floor. Head east and to the stairs. Follow the sand slides marked with the green arrows. Once you have control, hug the wall clockwise till you reach the stairs that lead to another treasure. Now step on the sand slide marked with the light blue arrows. From the end of the sand slide, walk east and follow the sand slides marked with violet arrows to get a treasure and be transported to the start again. Now walk north between the sand slides, and step on the one marked with the orange arrows. Hug the wall counter clockwise and step on another orange arrow-sand slide. Collect the treasure in the southwest, and use the green and then light blue arrows again to get back to the start once again. To finish up this floor, walk north between the sand slides again - but this time step on the sand slide marked with the dark blue arrows. Follow them till you reach the stairs. Then follow the path to the next floor. Follow the green arrows over the sand slides to a treasure and back to the start. Then follow the sand slides marked with the light blue arrows till you reach a small space with no sand slides in the northeast corner. Now follow the violet arrows to a treasure and back. Finally, follow the set of dark blue arrows over several sand slides till you reach the plateau in the middle. Activate the Porter and heal your team members. 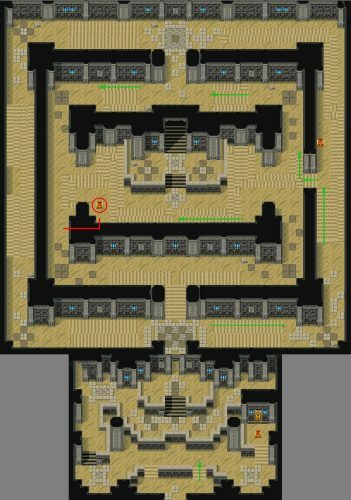 Then step inside the last room and challenge the next boss. Since he is weak against light, use holy light from Elysha if you have her in the team. Otherwise physical attacks work better against him. He has some nasty magic attacks that can hit multiple team members. Especially Disaster can kill 1-2 members of your team if they have less than 50% health. Use Elysha or Milka to cast ‘All Cure’ regularly to keep your team alive. You can also buff Grieg and your Hero with Willpower to increase the physical damage. Also, steal the ‘Crystal of Speed’ from the Ancient. After the battle, you can open the last chest to get the Sildra’s Mark. Port back to Sandora Tribe Hometown and deliver the mark to either Ahmad or Rahab (depending on which you chose to help before). He will give you the Treasure of Earth in return. Afterwards, talk to the man in the middle of the town just east of the wall. He will tell you about a cave in the north which is your next destination in search of another treasure. Before you leave, stock up on items and buy new equipment. Board the ship, then sail straight north from Sandora. When you reach the island, follow the river to the center of the island. Then go on land and walk clockwise around the island till you reach the Cave of Flames.